Over half a century of ministry, David Pawson has touched innumerable lives with his honest and uncompromising popular biblical theology. Now in his seventies, he has decided to write what will be one of the most eagerly-received autobiographies of any modern-day Christian leader. Not As Bad As The Truth is Pawson's written legacy to the Church. It will summarise the essence of his 'unorthodox evangelical' theology, including his beliefs on baptism, Israel, salvation, the End Times, male leadership, and divorce and remarriage. It will also discuss with honesty and insight the most significant events of his personal life - childhood and formative years, his failing health, and the blessings and challenges of family life. 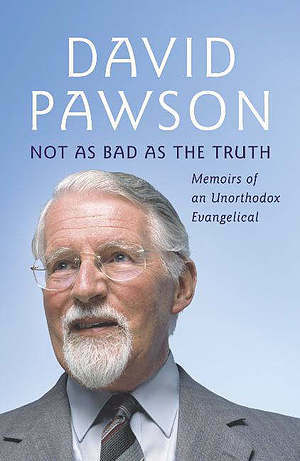 Pawson's commitment to biblical truth rarely fails to provoke a reaction. His teaching is loved and criticised in equal, passionate measures. Not as Bad as the Truth by David Pawson was published by Hodder & Stoughton in April 2006 and is our 17550th best seller. The ISBN for Not as Bad as the Truth is 9780340864272. Be the first to review Not as Bad as the Truth! Got a question? No problem! Just click here to ask us about Not as Bad as the Truth.